FERRARIO - [ Sandwich Island's rituals edifice ]. FERRARIO, G. - [ Sandwich Island's rituals edifice ]. [ Sandwich Island's rituals edifice ]. - FERRARIO, G.
Title : [ Sandwich Island's rituals edifice ].. Size : 6.7 x 9.6 inches. / 17.0 x 24.5 cm. 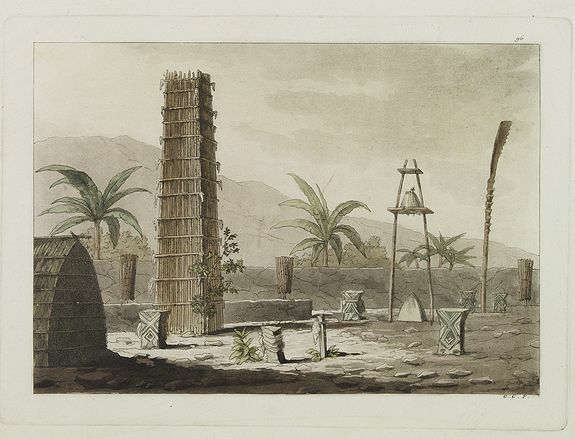 Description :Aquatint depicting Sandwich Island's rituals edifice. The Sandwich Islands was the name given to the Hawaiian Islands by Captain James Cook on his discovery of the islands on January 18, 1778. The name was made in honor of one of his sponsors, John Montagu, 4th Earl of Sandwich, who was at the time the First Lord of the Admiralty and Cook's superior officer. During the late 19th century, the name fell into disuse.